Need to select between a bunch of people? Selector will decide for you! Have everyone hold a finger on the device and the spinner will spin until it selects one person. Use it to pick who pays for dinner! Use it to decide who does the dishes! Use it to select the first player in a game! Selector will select between up to 5 people on the iPhone and up to 11 on the iPad. 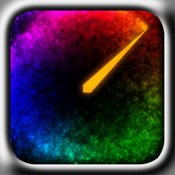 Features beautiful particle animation and fun interactive sounds. Also features compass, clock, and draw modes. Enjoy!